As we all know that Google is without any doubt a full-blown hardware company, but recently Google has announced about a new project "smart contact lens" that helps diabetics to measure their glucose levels. This recent Google X project is different than those of their previous projects. Company while it's announcement also unveils the secret behind how it works. These contact lens uses tiny wireless chip which is embedded in between two soft layers of lens material and a miniaturized glucose sensor. Those chips and sensor helps to measure glucose level with the help of wearer's tears. The company says it is currently testing prototypes of this contact lens and also working with FDA for production of real products of those prototypes. These lenses are not actually the miniaturized version of glass because these are for those diabetics who are faded up with the painful testing methods like testing blood droplets, pricking a finger tips multiple of times in a day because glucose levels change frequently with normal activity like exercising or eating or even sweating. 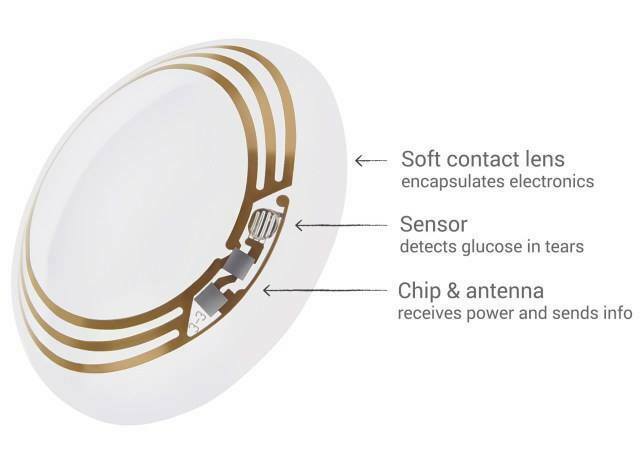 According to Google, the sensor fitted in the lens take about a reading per second which works with the tiny LED light in the lens that warns the wearer when their glucose level crosses than a set threshold. Those sensors are so tiny that they look like a bit of "Glitter". Google wants this lens to act as an early warning device for diabetics. As today diabetes is growing so fast among people that in a survey it has been found that, it affects one in every 19 people over the world. Uncontrolled blood sugar causes huge risk in life and leads to lots of dangerous complications which can either be some short-term as well as longer term, including damage to the kidneys, heart and eyes. While this is new view for Google, the idea of a contact lens for specifically measuring glucose levels whereas it is not new at all for Microsoft and the University of Washington worked on a similar project previously in 2011. Co-creator Babek Parviz and fellow co-founder Brian Otis were at the University of Washington and has contributed to that project as well. The company wants partners to develop these lenses and also build apps to make the measurements available to wearer and their doctor. Still there is dilemma, whether this lens will work according in the planned way but it is sure that it is one of the good projects of Google. Google has tried to solve a long-standing medical problem “Diabetes” There's no word on when this lens might be a reality, or even if it'll work as planned, but it's good to see Google using its engineering prowess to try and solve a long-standing medical problem. This lens will be the huge help for those people who are fighting with the numbers of problem caused by the diabetes. As this will help to indicate and warn them about their glucose levels. So, diabetics can get rid of those painful traditional methods of checking glucose level every day. Let’s hope this new concept of Google may get the huge market over the world. And, soon it will be bringing this technology in market by finding the right partners to cope up with. What really is Google Fiber? Why will everyone want it?